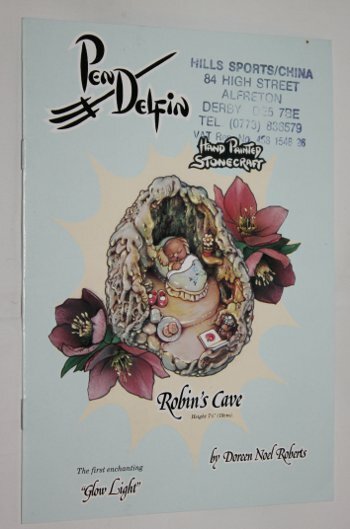 PenDelfin leaflet with the PenDelfin Robin's Cave on the front cover. The PenDelfin stand Robin's Cave was designed by Doreen Noel Roberts and only produced by the PenDelfin pottery from 1995 until 1999. This PenDelfin booklet opens like a book and features 12 pages of PenDelfin rabbits and stands including pictures of the PenDelfin china Breakfast Set, the PenDelfin Tea For Two Set & the PenDelfin Trinket Boxes! It also pictures many PenDelfin display stands including the PenDelfin Picnic Island, the Raft and the PenDelfin Cobble Cottage. Condition: Very good overall condition. This example does have a shop stamp on the top right hand corner from Hills Sport & China shop, Alfreton, Derbyshire.